Precautionary Statements (P-Statments) are part of the Globally Harmonized System of Classification and Labeling of Chemicals (GHS). Precaution statements provide standardized wording and/or pictograms to describe recommended measures that should be taken to minimize or prevent adverse effects resulting from exposures to a hazardous product, or improper storage or handling of a hazardous product. 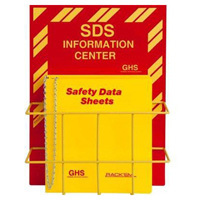 The GHS also has Hazard Statements which provide standardized hazard wordings. You will usually find both P- and H-statements on a label or MSDS. In the European Union, P-statements will replace Safety phrases (S-phrases), as the GHS is phased in per Regulation (EC) No 1272/2008. Precautionary statements are assigned a unique numerical code which can be used as a handy reference when translating labels and MSDS's written in other languages. The codes are not a substitute for writing out the entire text of the statement. 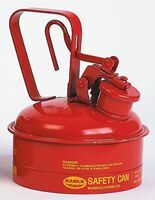 Thus, an MSDS or label might bear a statement such as "Pressurized container; Do not pierce or burn, even after use (P251)". P indicates a Precautionary Statement, the 2 indicates it is a prevention precautionary statement, and 51 is part of the numbering scheme. Oxidizing liquids (chapter 2.13) 1 - specify to keep away from clothing and other combustible materials. P221 Take any precaution to avoid mixing with combustibles/.. Oxidizing liquids (chapter 2.13) 1, 2, 3 ... Manufacturer/supplier or the competent authority to specify other incompatible materials. P230 Keep wetted with ... Explosives (Chapter 2.1) Divisions 1.1, 1.2, 1.3, 1.5 ... Manufacturer/supplier or the competent authority to specify appropriate material. - if drying out increases explosion hazard, except as needed for manufacturing or operating processes (e.g. nitrocellulose). Acute toxicity, inhalation (chapter 3.1) 1, 2, 3 - if product is volatile so as to generate hazardous atmosphere. P240 Ground/bond container and receiving equipment. Explosives (chapter 2.1) Divisions 1.1, 1.2, 1.3, 1.4, 1.5 - If the explosive is electrostatically sensitive. Flammable liquids (chapter 2.6) 1, 2, 3 - if electrostatically sensitive material is for reloading. Flammable solids (chapter 2.7) 1, 2 - if electrostatically sensitive material is for reloading. P241 Use explosion-proof electrical/ventilating/lighting/.../equipment. Flammable liquids (chapter 2.6) 1, 2, 3 ...Manufacturer/supplier or the competent authority to specify other equipment. Flammable solids (chapter 2.7) 1, 2 ...Manufacturer/supplier or the competent authority to specify other equipment. P250 Do not subject to grinding/shock/.../friction. Explosives (chapter 2.1) Divisions 1.1, 1.2, 1.3, 1.4, 1.5 ...Manufacturer/supplier or the competent authority to specify applicable rough handling. P264 Wash...thoroughly after handling Acute toxicity - oral (chapter 3.1) 1, 2, 3, 4 ...Manufacturer/supplier or the competent authority to specify parts of the body to be washed after handling. P280 Wash...thoroughly after handling Explosives (chapter 2.1) Divisions 1.1, 1.2, 1.3, 1.4, 1.5 Specify face protection. Manufacturer/supplier or the competent authority to specify type of equipment. Flammable liquids (chapter 2.6) 1, 2, 3, 4 - Specify protective gloves and eye/face protection. Acute toxicity - dermal (chapter 3.1) 1, 2, 3, 4 - Specify protective gloves/clothing. Skin corrosion (chapter 3.2) 1A, 1B, 1C - Specify protective gloves/clothing and eye/face protection. Skin irritation (chapter 3.2) 2 - Specify protective gloves. Severe eye damage (chapter 3.3) 1 - Specify eye/face protection. P284 Wear respiratory protection. Acute toxicity, inhalation (chapter 3.1) 1, 2 Manufacturer/supplier or the competent authority to specify equipment. P285 In case of inadequate ventilation wear respiratory protection. Respiratory sensitization (chapter 3.4) 1 Manufacturer/supplier or the competent authority to specify equipment. P320 Specific treatment is urgent (see ... on this label). Acute toxicity, inhalation (chapter 3.1) 1, 2 ...Reference to supplemental first aid instruction. P321 Specific treatment (see ... on this label). Acute toxicity, oral (chapter 3.1) 1, 2 ...Reference to supplemental first aid instruction. Acute toxicity, inhalation (chapter 3.1) 3 ...Reference to supplemental first aid instruction. Skin corrosion (chapter 3.2) 1A, 1B, 1C ...Reference to supplemental first aid instruction. - Manufacturer/supplier or competent authority may specify a cleansing agent if appropriate. Specific target organ toxicity, single exposure (chapter 3.8) 1 ...Reference to supplemental first aid instruction. P322 Specific measures (see ... on this label). Acute toxicity, dermal (chapter 3.1) 1, 2 ...Reference to supplemental first aid instruction. P372 Explosion risk in case of fire. Explosives (chapter 2.1) Unstable explosives and Divisions 1.1, 1.2, 1.3, 1.4, 1.5 - except if explosives are 1.4S AMMUNITION AND COMPONENTS THEREOF. P373 DO NOT fight fire when fire reaches explosives. Explosives (chapter 2.1) Unstable explosives and Divisions 1.1, 1.2, 1.3, 1.4, 1.5 - except if explosives are 1.4S AMMUNITION AND COMPONENTS THEREOF. P374 Fight fire with normal precautions from a reasonable distance. Explosives (chapter 2.1) Division 1.4 - if explosives are 1.4S AMMUNITION AND COMPONENTS THEREOF. P370 + P378 In case of fire: Use ... for extinction. Flammable liquids (chapter 2.6) 1, 2, 3, 4 ...Manufacturer/supplier or the competent authority to specify appropriate media. P401 Store ... Explosives (chapter 2.1) Unstable explosives and Divisions 1.1, 1.2, 1.3, 1.4, 1.5 ...in accordance with local/regional/national/international regulations (to be specified). 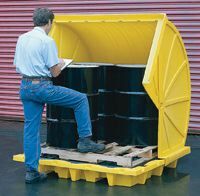 P406 Store in corrosive resistant/... container with a resistant inner liner. Substances and mixtures corrosive to metals (chapter 2.16) 1, 2, 3 ...Manufacturer/supplier or the competent authority to specify other compatible materials. P411 Store at temperatures not exceeding ...°C/...°F. Self-reactive substances and mixtures (chapter 2.8) Types A, B, C, D, E, F ...Manufacturer/supplier or the competent authority to specify temperature. P413 Store bulk masses greater than ... kg/... lbs at temperatures not exceeding ...°C/...°F. Self-heating substances and mixtures (chapter 2.11) 1, 2 ...Manufacturer/supplier or the competent authority to specify mass and temperature. P420 Store contents under ... Pyrophoric liquids (chapter 2.9) 1 ...Manufacturer/supplier or the competent authority to specify appropriate liquid or inert gas. P404 + P233 Store in a well-ventilated place. Keep container tightly closed. 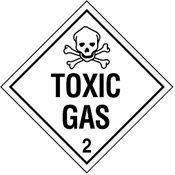 Acute toxicity, inhalation (chapter 3.1) 1, 2, 3 - if product is volatile so as to generate hazardous atmosphere. P411 + P235 Store at temperatures not exceeding ... °C/... °F. Keep cool. Organic peroxides (chapter 2.15) Types A, B, C, D, E, F ...Manufacturer/supplier or the competent authority to specify temperature. 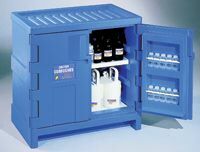 Ensure your hazardous materials are properly stored with equipment from Safety Emporium. P501 Dispose of contents/container to ... Explosives (chapter 2.1) Unstable explosives and Divisions 1.1, 1.2, 1.3, 1.4, 1.5 ...in accordance with local/regional/national/international regulation (to be specified). P-statements are not currently required on labels or MSDS's by U.S. OSHA, however, this will eventually change as the US moves towards using the Globally Harmonized System of Classification and Labeling of Chemicals (GHS). In the European Community, P-statements are being phased in and will replace safety phrases which are already required by law. You should expect to start seeing P-statements on your MSDS's and labels over the next few years. Remember that P-statements phrases only indicate the safety precautions that you need to follow when using the material, not the explicit hazards of the material. For hazards information see the Hazard Statements entry. The Provisions for Classifying Dangerous Preparations (see Schedule 3) discusses how risks and risk phrases are quantified. See also: ANSI, CHIP, EINECS, Hazard Statements, risk phrases, UN/NA numbers, and the International Section of the MSDS FAQ.